I need a bigger plate - Stop staring and start sewing! I'm finally out of my flu fog so I'm attempting to get a few things done around here. I'm trying to get my website re-designed and at least semi-functioning by next week. The current look, although a lovely dedication to Heather Bailey's still fresh Freshcut fabric, is not as inclusive as it needs to be (I guess I'm looking for more of a dedication to Heather, Jennifer, Denyse, Joel, Sandi, Dena, Amy, Tina and anybody else who shows up). I've made a pretty site on my new computer (remember when I said this was a sign from God that I would soon have a Mac? Well, alas it was true!) but I cannot for the life of me figure out how to publish it into an actual website and I'm running out of time (but I did manage to make a blog banner. What do you think?). I'm trying to be ready to catch the wave of Mary Engelbreit fans (of whom I am the fanniest biggest fan, I'm sure!) who will read the next issue and then feel compelled to look me up. I had the chance of a lifetime in helping Heather out with it (that's a whole 'nother post and believe me, it's coming) and my stomach is all atwitter with anticipation as I know it should hit my mailbox in approximately 11 days 1 hour and 14 minutes (or there-abouts). Pile a little PMS on top of it all and you've got me cowering in the corner of my closet sucking my thumb while rubbing my earlobe between my thumb and finger and humming to myself. In the meantime my paypal account (or latte fund) is growing quite anemic so I'm working on a few little things to help plump it up again. Including some more super secret sources revealed! 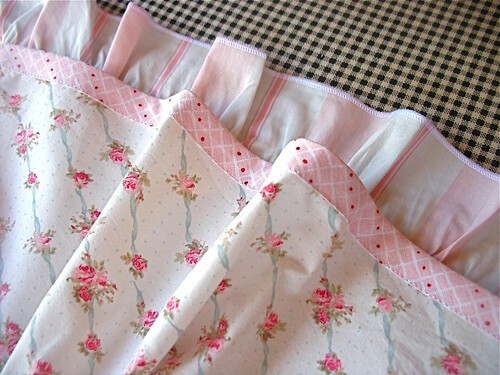 I've got a couple of twirly sets on my sewing table and they're looking pretty cute so far. This one is made from Rachel Ashwell's Simply Shabby sheets (Target!) and I used the fabric from an IKEA duvet for the bias hem. 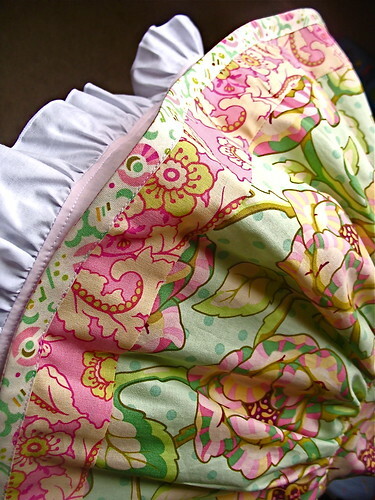 The ruffle is from some Pottery Barn Kids sheets. Fun! I have a sweet tank top to go with it. 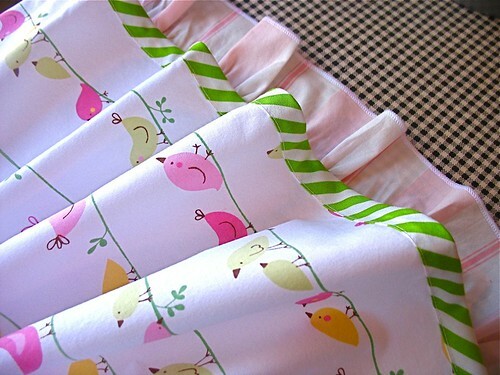 And this one is that darn bird fabric again (still loving it and have tons left!). The bias is from Jennifer Paganelli's Basics line (the lime Casey stripes) and this is why I love stripes...they make the best bias because they slant like a barber's pole and it's so cute! But most importantly I need to get this sweety sent out to Kelly who won my drawing back in January and was expecting her outfit last week (dang flu!). It will be a great outfit for Easter I think. I love working with nice fabric like this, it just feels good when it's running through my hands as I'm sewing (in fact I just ordered a bunch for Fabritopia and I'm crossing my fingers that Free Spirit still has some in stock). Anyway, I've got some other things on my plate and some more super secret sources to share soon but it's almost 80 degrees here and I may just have to go out and get a good dose of vitamin D. Thanks for all the great comments and questions you've been leaving! I love reading and answering them!